My 15 Minutes? Nah, I’ll get more. Popgun Volume 1 has received a really cool write up on CBR today. It talks a little about the different people involved in the project and also give a brief synopsis of some of the stories. You know what this means, right? You got it; yours truly has also received a mention. I find this awesomely cool, because this is a site that I have read daily for as long as I knew it existed, at least 6 years. I read it because it talks about all of my favorite artists. So to see MY name mentioned is just geeking me way out. I know, I know, but hey I’m excited and had to share. Newcomer artist Kevin Myers debuts his first published work in “PopGun,” in a story written by Michael Woods called “Rocket Racers.” Said Woods, “On the surface, ‘Rocket Racers’ is a story set in an alternate 1960s where people race professionally with rocket packs. But, really it’s about a man having to choose between the woman he loves and the thing he is passionate about most. And thanks to you guys for being happy about it with me. Check out the full story for yourself, here. Grab yours today at any of these locations!!! In the UK? Go Here! Wanna order it from your local Comic shop? Here is the Preview order code SEP07 1958. Hi again… as promised, here is one of the designs from my upcoming story in Popgun Volume 1 written by Michael Woods. To give you an idea of just what Rocket Racers is about check out how Michael Woods sums it up. On the surface, Rocket Racers is a story set in an alternate 1960’s where people race professionally with rocket packs. But, really it’s about a man having to choose between the woman he loves and the thing he is passionate about most. I will tell ya, that Michael wrote an amazing story that was a blast to illustrate. Working with Michael was as easy as pie. He sat back and let me have at it and didn’t add to the pressures I was already putting on myself. Michael approached me about working on Popgun a while back, and I am extremely happy and very thankful that he did. So before I thank the academy, I need to thank Michael Woods. Thank you Michael. You helped make a very BIG dream come true. More stuff coming in the next few weeks. More designs and sample pages. 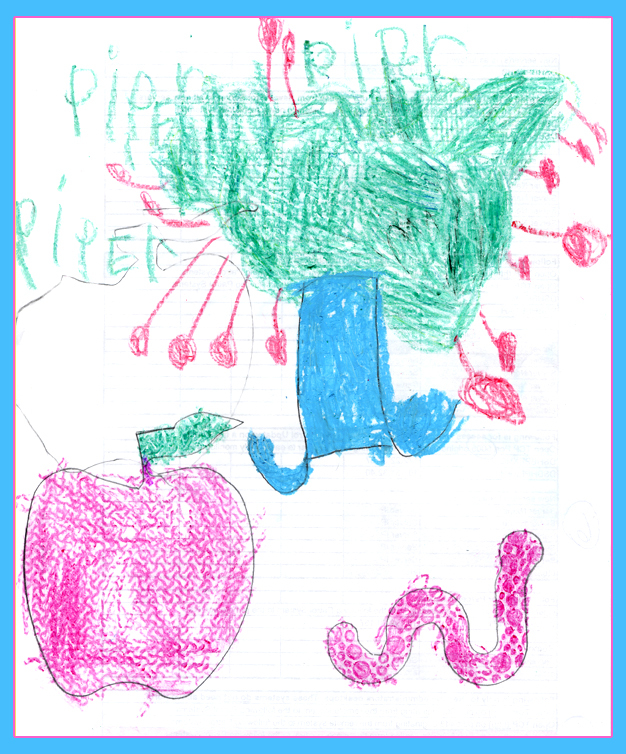 My daughter, whom I call “Squirrel-Girl”, asked me to put her picture up on MY internet. So how could I resist putting her pic up after she gave me the internet. She’s turning into a regular artist. I think I could take a lesson or two from her. Popgun! Get your Popgun here. I am proud to announce that my first published comic book art is coming out in November in an anthology called Popgun Volume 1, published by Image Comics. My art is featured in a short story written by Michael Woods. 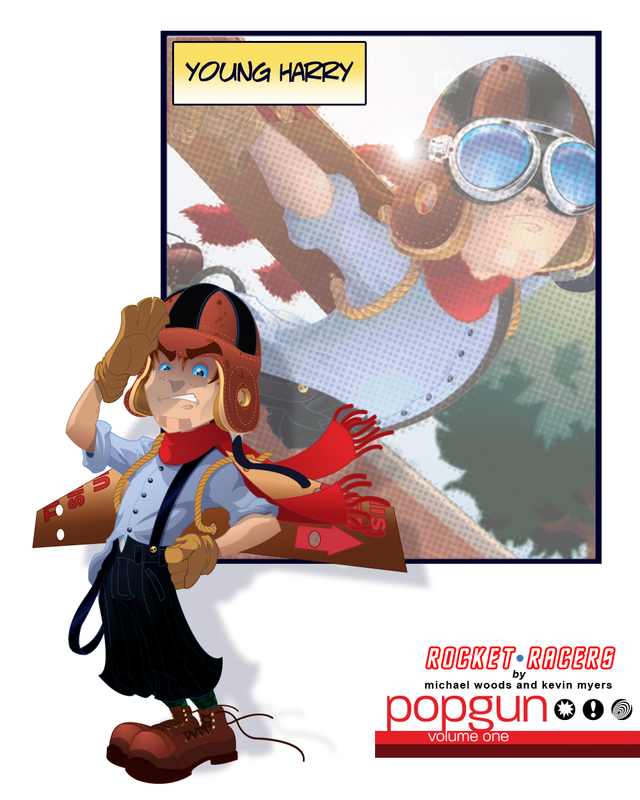 Popgun is 400 + pages of spectacular stories written and illustrated by some of the today’s biggest names in Comics and some bright up-and-comers. I snagged the following description from Diamond Comics Distributors site. Image Comics loads a roster of comics’ most creative artists and writers into the Popgun Vol. 1 Original Graphic Novel (SEP07 1958, $29.99), a massive, 400-page vehicle for a wide range of entertaining stories and works. Image anthologies like Put the Book Back on the Shelf: A Belle & Sebastian Anthology (DEC05 1753, $19.99), Four-Letter Worlds (NOV04 1533, $12.95) and many others have served as stellar showcases of its commitment to bringing readers outstanding work from established and rising creators. With a host of luminaries handling the writing and art, Popgun Vol. 1 should continue that tradition. 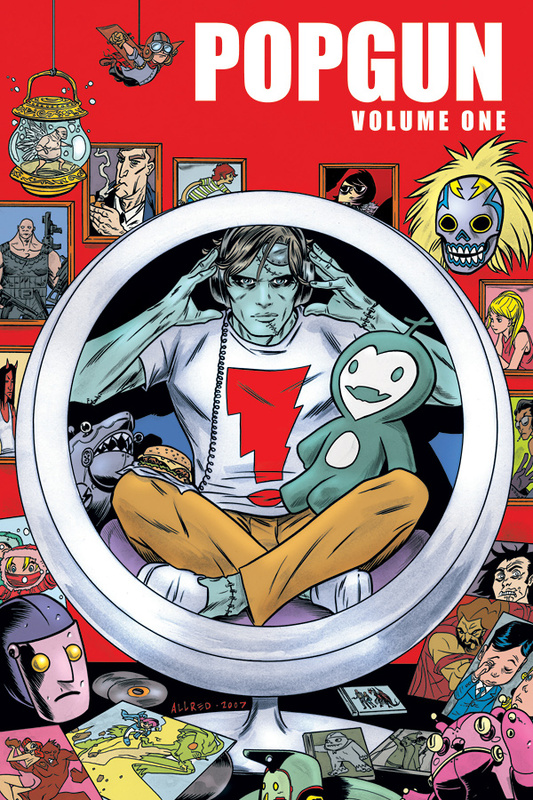 Included in this “ultimate graphic mixtape” are stories by Mike Allred, Chuck BB, Mike Bullock, Benito Cereno, Dave Crosland, Toby Cypress, Brandon Graham, Shepherd Hendrix, Jonathan Hickman, Eva Hopkins, Joe Keatinge, Erik Larsen, Jason Latour, Corey Lewis, Joseph Michael Linsner, Jim Mahfood, Derek McCulloch, Chris Moreno, Moritat, Khary Randolph, Rick Remender, Jamie S. Rich, Mark Sable, Tim Seeley, M. Zachary Sherman, Mark Andrew Smith, Richard Starkings, Jame Stokoe, Nick Stakal, Doug Wagner and others. The full-color Popgun Vol. 1 OGN features a cover by Allred and is scheduled to ship on November 21. You can check out the official website at www.hiddenrobot.com/POPGUN. So Grab yours today at any of these locations!!! I will be throwing up some of my concept work and some page samples over the next few weeks, as well as more info about Michael Woods’ and my story… Rocket Racers. ramping it all up in November in time for the release of Popgun! This guy belongs with the dragon Ragdon,Ntry, and Sasson. They make up a sort of “army of darkness”. 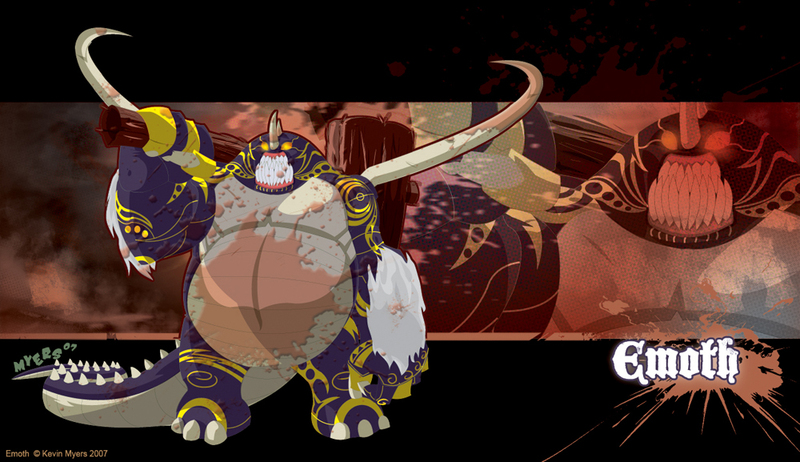 His name is Emoth and he is a Giant almost tank like creature. Except is much larger than a tank. He is HUGE. When I was creating him I was thinking of a creature that just walks through armies smashing them with each step. He too is part of a story that I would like to do, sometime in the future, that I haven’t told ya about as of yet. Anyway let me know what you guys think.